“Now after the wise men had left….” How strange that that is how today’s gospel (Matthew 2: 13-15, 19-23; Second Sunday after Christm) begins. We hear of their departure before we hear of their arrival. The wise men left before they’ve even arrived. At least that’s what happens as the readings are presented to us in the liturgy. We don’t hear the story of the wise men’s arrival until tomorrow, the Feast of the Epiphany. 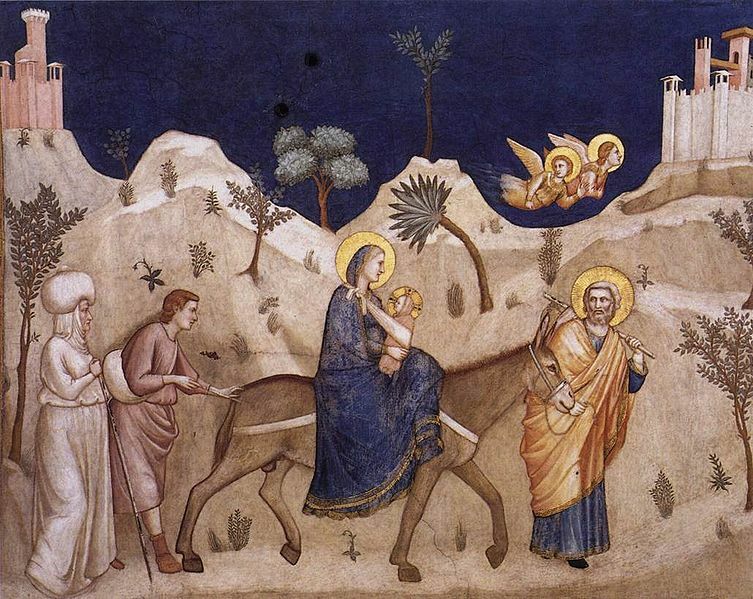 Chronologically, the story goes like this: Jesus is born, the wise men visit, the holy family flees to Egypt. We, however, hear the story in this order: Jesus is born, the holy family flees to Egypt, the wise men visit. So, what’s up with that? Why would the Church ask us to hear the story out of order? Some of it is just the way the calendar falls this year but I think there is more to it than that. To hear the story out of order makes us slow down and listen a bit more closely. Maybe it’s the Church’s way of yelling, “Wake up and pay attention!” Maybe it allows us to hear something we’ve not heard before. With the birth of Jesus God entrusts God’s self to humanity. God becomes one of us and lives among us. God comes to us as we are. The world does not get cleaned up, sanitized, and made presentable for the birth of Jesus. The Christmas story is not one of preparing the nursery, painting the walls, and making it look cute. It is a story that reveals the truth about God and humanity. That God comes to us as a newborn offers us a new beginning. It also reminds us that the divine life is vulnerable, fragile, and needs to be cared for and protected. There is nothing sentimental or romantic about Matthew’s version of the Christmas story. It’s reality life. Before we can celebrate the Epiphany light, the arrival of the wise men and the manifestation of the Christ to the world, we must first remember and acknowledge the darkness of our world. That’s what the reordering of the story does for us. Today’s story reminds us that Herod is real, not only in Jesus’ time but in ours as well. I don’t know if the slaughter of the innocents happened the way Matthew describes it but I know it is a true story. It has been lived in every age throughout history. I don’t know if Herod really killed all those babies but I know that the Herods of this world will always seek to destroy life, that which is holy and sacred. Herod is in the news every day. You won’t see or hear his name but you’ll recognize him. He’s hard to miss. He’s in some of our families and relationships. He’s in some of our own words, actions, and choices. Herod is our indifference that prevents compassion, our hate and anger that destroy love, our busyness and distractions that deny presence, our violence and anxiety that defeat peace, our inhumanity that negates our creation in the image and likeness of God, and our politics when it is narrow, self-serving, discriminatory, and exclusive. Our world and sometimes our lives are full of Herods. Today’s gospel will not let us deny Herod’s existence. That doesn’t, however, mean that all is lost. It means that the world of Herod is the world into which Jesus is born. The world of Herod is the world in which Jesus puts our lives back together. The world of Herod is the world in which Jesus reveals God is with us and for us. To see Herod before the wise men invites us to move from the darkness of today’s gospel to the light of tomorrow’s Epiphany. Herod’s darkness is not the final reality. Darkness will not prevail. That means, however, that each of us, just like Joseph, has both the opportunity and the responsibility to guard the divine life and protect that which is holy and sacred. That life, that holiness, that sacredness is not only about Jesus it’s also about you and me. It’s about our lives and our relationships. It’s about people we know and people we’ve never met. It’s about the infinite ways in which the divine life is entrusted to all of us. This divine life is the gift of God for the people of God. Look at your life. Where do you see holiness? What’s sacred? In what ways is God entrusting himself to you? Don’t give me soft, vague, and mushy answers like love, peace, or happiness. I don’t want that. I want names. I want places. I want events. I’m not trying to limit or restrict God’s holiness and presence. I’m trying to get us to see the flesh and blood God born on Christmas, an embodied God, a God that comes to us in ways as unique as are each of our lives. So be specific. God is. God comes to us in very tangible ways. Where is God showing up in your life? How? In or by whom? Call them by name. Picture their faces. Return to the places. Perhaps it’s in your marriage, your husband or wife, and the life you have created together. Maybe it’s the child or grandchild God has entrusted to you. Maybe it’s the holiness of a best friend. Maybe it’s an early morning cup of coffee and the silence of divine presence. Maybe it’s in reading the scriptures. Maybe you experience the liturgy as the joining of heaven to earth and earth to heaven. For many it will be the beauty of nature: a sunrise in which you offer yourself to God, a sunset in which you give thanks for your life and those you love, or a starry sky and the realization that everything you see speaks of God. For some of you the ordinary routine of work becomes the place in which your life and God’s life intersect. Maybe studying is a way in which God entrusts himself to you. You read, think, question, pray, and your eyes open to a new way of seeing. It might be your prayer group, shared intimacy, and the experience that wherever two of three are gathered Christ is there. For some it will be your passion for the poor, feeding the hungry, speaking out for justice, or visiting the sick or dying. I know many of you experience the sacredness of your work around this parish; preparing and setting up for the liturgy, fixing meals for the sick or grieving, working in the office, caring for the building, or helping run our parish school. Every one of you could add to my list. There are thousands and thousands of ways in which God offers his life to us, entrusting us with that which is holy and sacred. With each gift God says, “Here, this is yours. Care for it. Guard and protect it. Nurture it. I trust this to you. I have no one else. You are Joseph. 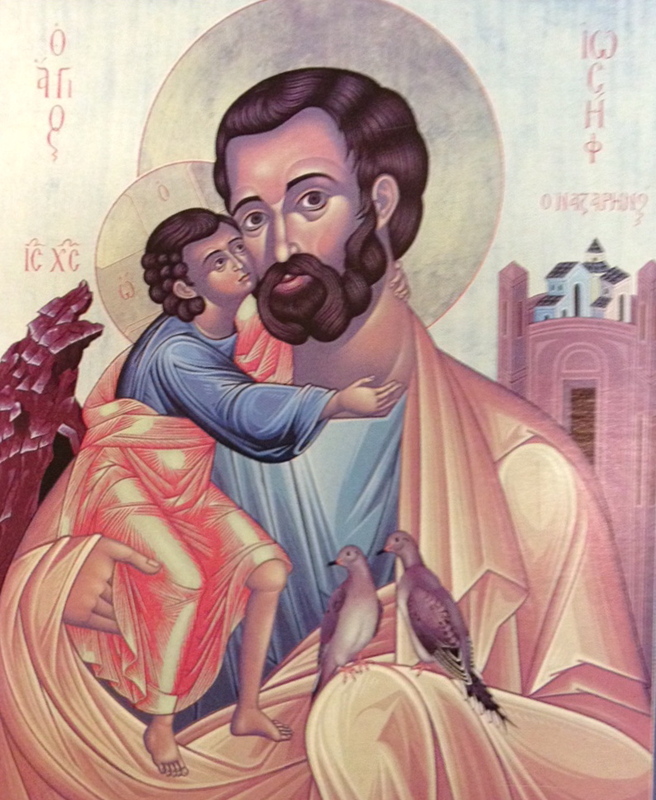 You are the one to do this.” So how do we care for and protect that life, beauty, and holiness in a world of Herods? When it comes to the holy life of God with us, Emmanuel, Jesus, it is always a matter of life and death; the child’s, each other’s, our own. God has entrusted his Son to each one of us in a variety of ways. Just like Joseph we stand in the middle between Jesus and Herod, between life and death, between the life-giver and the life-taker. No one gets to ride the fence, however. We can’t stay in the middle. Each one of us chooses. Day by day, minute by minute, we choose. Over and over again we choose. Will we get up and take the child and his mother or will we sleep through and miss what God is doing in our lives? What will it be for you? For me? What are we choosing? Are we nurturing and growing the life of Christ within us? How are we caring for the sacred pieces and parts of our lives? How are we creating a home for Jesus? Don’t be too anxious or distracted by Herod. Remember, neither God nor Joseph dealt directly with Herod. They didn’t give Herod time, attention, or effort. Maybe we shouldn’t either. That doesn’t mean we deny or ignore the Herods of our lives. It means, rather, that we gain more by nurturing, feeding, and growing the divine life. It means that our work is to cultivate deep relationships, a life of prayer, and love for all people. It means that in the end holiness always wins. I’m very touched by the way you speak here about Joseph and in the earlier post about him, and how close he came to not choosing the commitment. I had an experience just before Christmas involving a client I’d been working for and a colleague. The colleague was driving me nuts, complaining over and over again about the boss, and I was just starting to have the conversation with myself about walking away from her, and from the 12-month commitment to the client. As a last-ditch thing one day I talked to her about it. I can’t remember what I said but I was blunt about the effect of the complaining. At first she was annoyed and defensive but we stayed in the conversation. A day or two later she rang me and said she’d seen something about herself and how it affected her relationships with bosses. She rang up the boss and told him about it and apologised for her complaints, and made a new commitment to him. Since then, she is like a new person. And immediately she won two grant applications she’d made on behalf on the company, where she hadn’t won any for the previous 9 months! We went into Christmas, the whole team united and one and celebrating these wins. And I felt such a part of it. I was so close to dismissing her and the client, and I would have missed it all. Narelle, that is such a great story. Thank you for sharing it. It raises so many important issues: patience, commitment, perseverance, presence, honesty, self-refelction. You were a part of birthing new life. I especially like the part about 9 months. How fitting! Thanks Mike for your wisdom, your words are right on even in our time. The Wife & I have learned so much from your Gospels Explained. Thank you, Donald, for your encouraging words. Epiphany blessings on you and your family. Click the image to learn more about Fr. Mike and Interrupting the Silence. A Sermon for Easter 3C, John 21:1-19. Dark Night Fishing or Resurrection? Copyright © 2009-2019 Michael K. Marsh and Interrupting The Silence, Some Rights Reserved. Interrupting the Silence by Michael K. Marsh is licensed under a Creative Commons Attribution-NonCommercial-ShareAlike 4.0 International License. Permissions beyond the scope of this license may be available by contacting Michael K. Marsh.